Surf on the internet in search for a new wordpress themes blog, I got a rather interesting collection of designs.Periodically, one has to look patterns, but these I have not seen - demonstrates a creative approach to displaying content, another shocking variegated color, and the third is ideal for design blog. Which of the following options corresponds to a particular description - guess yourself. What can we say about this topic wordpress - it is made ​​in a rather nice color, has a non-standard design all kinds of details - the menu of the blog posts, a pleasant and functional footer below. On top of the main displays elected post, but the transition is not a complete text of the article will see a small text about the author. This trend is directly west of blogs after each publication to place these messages. It also supports tree-like comments. If I understand correctly, the archive has three bright colors. 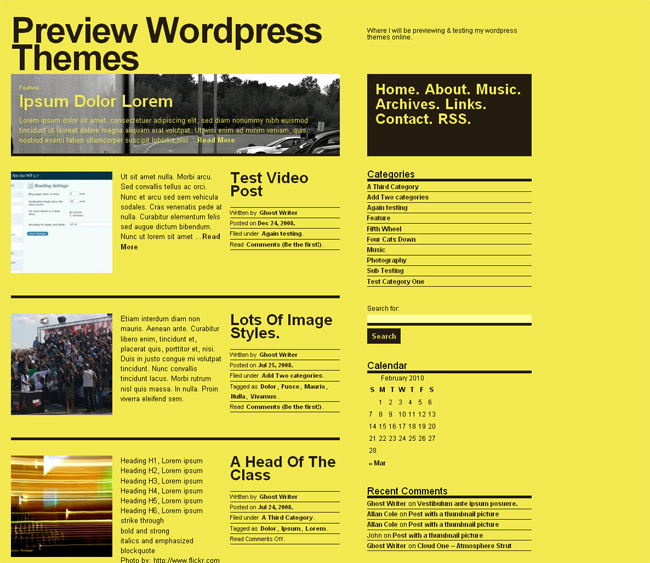 A very specific theme wordpress, which is a bit shocking color solution. However, I just had some association - first, western union, and secondly, the "yellow pages" - is a tremendous reference information. Actually, you can play a little bit on this and create a project in these destinations, attracting visual attention - is also a useful thing might just need a little muted yellow background. As for the topic, it uses popular font Helvetica Neue, supports widgets, and has a lot of columns to insert information. The efficiency was tested in all popular browsers, make-up - completely valid. Perhaps the most unconventional themes wordpress, which I have ever seen. This will not find even in Wparchive - Archive Premium WordPress themes . Developer Paul Bennett used the idea of displaying posts on the main page according to the timeline (this is best seen in the demo than in the picture in the article). You can scroll through this same line thereby selecting positions for a certain period. As a publication used as a simple text and insert a photo or video. Video is imported from the service Youtube. In addition, the pattern is a search that works and displays the results in real time as you type a search query! No less original is the footer where you can find the latest published and visited your blog posts, a list of pages. In short, the author apparently has realized all the things about for so long dreamed of because the theme wordpress is truly original, unconventional and urban. And now attention! 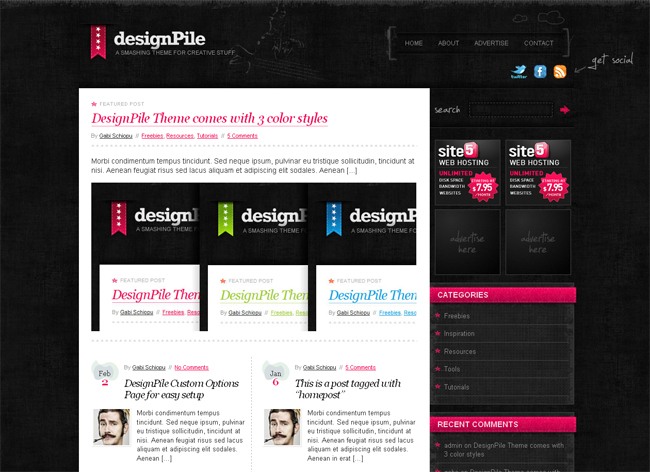 Continuation of this post and another 3 cool wordpress theme I will publish in its new blog,Inside WordPress . There's also templates you'll find the useful information on working with the system, which come in handy for both novice and advanced users. Only interesting, relevant and useful articles. subscribe to RSS and add a blog site - you will not regret it!